If you are seeking reasons for greening your teaching for the sake of your students' future (and I'm hoping that's why you're here), you will find a transformative, solid and salient rationale below. GreenHearted's green curriculum model was designed to be flexible, adjustable, and suitable for any curriculum. You simply teach your subject, course or grade, keeping the age-appropriate environmental / sustainability focus (and the future for all life on Earth) in mind as you're planning, teaching, evaluating and choosing learning resources. If, however, you are one of the many teachers who now recognize the urgency of teaching for sustainability, you might be lamenting that there's just not enough time to do it if you're going to get through the curriculum. This is where courage comes in! Perhaps you shouldn't say anything at all — and just do it? If you're doing good in the world, contributing to a better future for your students, why broadcast it to people who might stop you? But if you want to get parents, colleagues, principals and other administrators on side and supporting you, you'll need a strong rationale. The world urgently needs transformative sustainability education. According to research even more recent than the Intergovernmental Panel on Climate Change 2007 reports, we must drop greenhouse gas emissions to virtually zero and move to a renewable energy economy by phasing out fossil fuels long before 2050 if we want to avoid runaway global warming and climate catastrophe. As someone named Steve Bloom once said, "One of the difficulties we face is that further research is prone to discovering that things are worse than we thought, since the default assumption is that the unknown is benign." Sadly, we are increasingly discovering that what we don't know is going to hurt us — especially our children — and is already devastating people and places in many parts of the world. Carbon feedbacks are kicking in, which means that the warmed planet is now emitting extra greenhouse gases, leading to further warming. Time is truly of the essence. The Secretary-General of the United Nations, Mr. Ban Ki-moon, agrees: "The one thing we do not have is time." In order for today's students to be part of the solution when they graduate, they'll need to learn new things in school now. Because time is of the essence, we cannot wait for curriculum committees, curriculum review, and curriculum revision to change what we teach. Our students are living in (not "on" and separate from) a planet that is already degraded — with global warming-induced ocean acidification and climate catastrophes such as droughts and wildfire; air and water pollution; ozone depletion; land degradation and loss of species; desertification of southern Europe and the Amazon rainforest; devastation of coral reefs. The list goes on. When our students are adults, they will be living in a planet in severe decline. Today's curriculum must teach for this new reality. 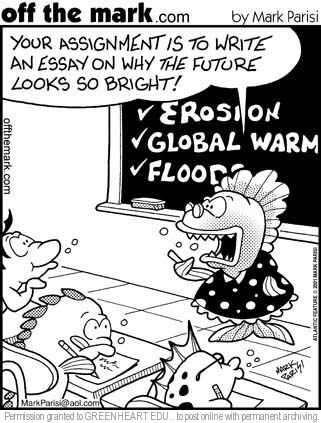 We're stuck in an outdated "curriculum box"
Because of global warming and climate change, we now live (and teach) in a world heading for the collapse of human civilization and possibly the mass extinction of species (including our own). We have to face it, much of what we teach is outdated and irrelevant. But curriculum hasn't been revised to reflect the urgency of this new — and scary — global situation. We're still teaching a 20th century (oftentimes a 19th century) curriculum that ignores 21st century realities. All of society mobilized — and fast! — when World War II became a threat. Our education system can and must mobilize quickly again, along with the rest of society, to move us from fossil-fuel dependence (and greenhouse gas emissions) to a safe and clean renewable energy economy. Our students will need new knowledge, skills and attitudes in order to become members of a green workforce. What better time to green your teaching? Educators all over the world learned how to teach for sustainability during this United Nations initiative. Recent research shows how vital it is for children to spend time in the natural world. And because many parents no longer let their children play freely outdoors, schools must give their students the opportunity to play and learn in Nature. Research conducted in the United States showed that integrating learning around the environment as the major theme or context improved achievement scores in language arts (reading and writing), math, science and social studies. And what a great way to implement constructivist learning. This rationale certainly piques the interest of school administrators. One school I've worked in saved $250,000 — that's a quarter of a million dollars! — in its first two years of greening measures! Greening our teaching allows us to serve our students — and their future — as role models, mentors, and wise elders. Many companies now offer environmental education to their employees, but it makes sense for schools to educate in ways that will give our students a knowledge base in sustainability before they head out into the world of work. We are in the midst of a planetary emergency. Spending time teaching adverbs and the War of 1812 can now be deemed negligent. We must start teaching the children what they'll need in order to create the best possible future for themselves. That's what GreenHeart Education is all about. Do you have a great story about convincing others of the need to green your teaching? Have you come up with another reason for implementing transformative education for sustainability? Have you used one of these rationales or a different one with parents, your principal, or other administrators? We would love to hear your success story — or even a cautionary tale or one with a sad ending. Your "reason for greening" story will appear on its own webpage the way you enter it here (we reserve the right to proofread). TIP 1: The name of your story, as you type it in above, will be the name of your webpage as well as the link to it. TIP 2: Since most people scan web pages, please include your best thoughts in your first paragraph.